L'viv, Ukraine. Golden Rose Synagogue ruin. Photo: Samuel D. Gruber (2008). 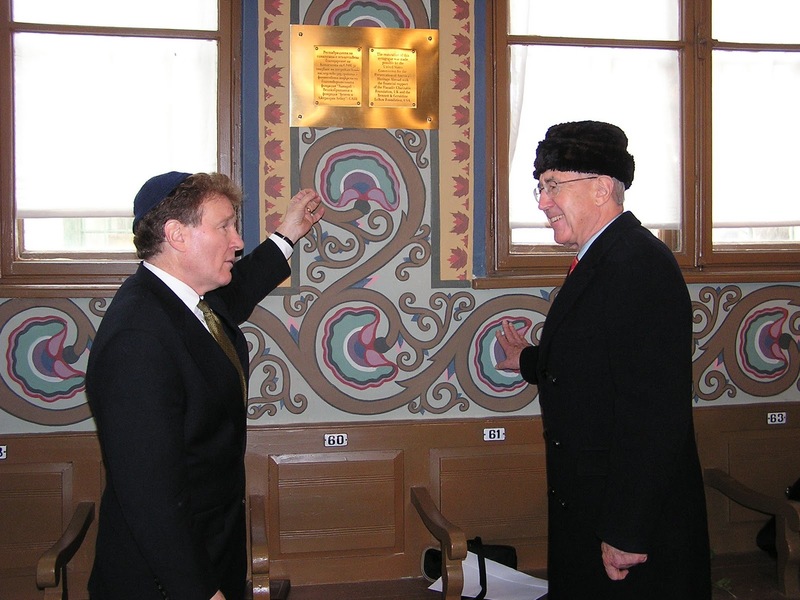 Ukraine-born, L'viv-trained and Israeli-based architectural historian Sergey R. Kravtsov, has been studying the history and architecture of Golden Rose Synagogue, destroyed in the Second Wold War and surviving as a ruin, for at least a decade. He has now produced a handy history of the building based on a variety of source materials and recent archaeological excavations that must be the starting point for any consideration of its future conservation, rebuilding and use -- for religious, commemorative or cultural purpose. L'viv, Ukraine. 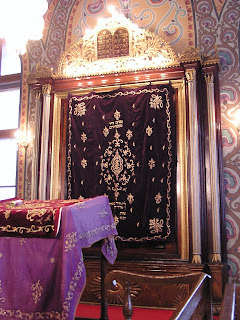 Golden Rose Synagogue. 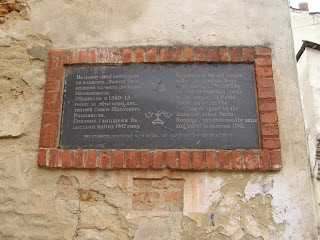 Commemorative plaque at synagogue ruin. Photo: Samuel D. Gruber (2008). L'viv, Ukraine. 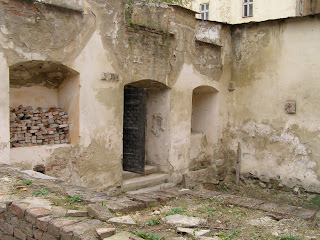 Golden Rose Synagogue ruin. Sergey Kravtsov discussing the building's history and architecture. Photo: Samuel D. Gruber (2008). The book is the newest publication on historic synagogue architecture from Bet Tefila - Research Unit for Jewish architecture in Europe. Bet Tefila is a joint effort of the Technische Universität Braunschweig and the Center for Jewish Art, Hebrew University, Jerusalem. 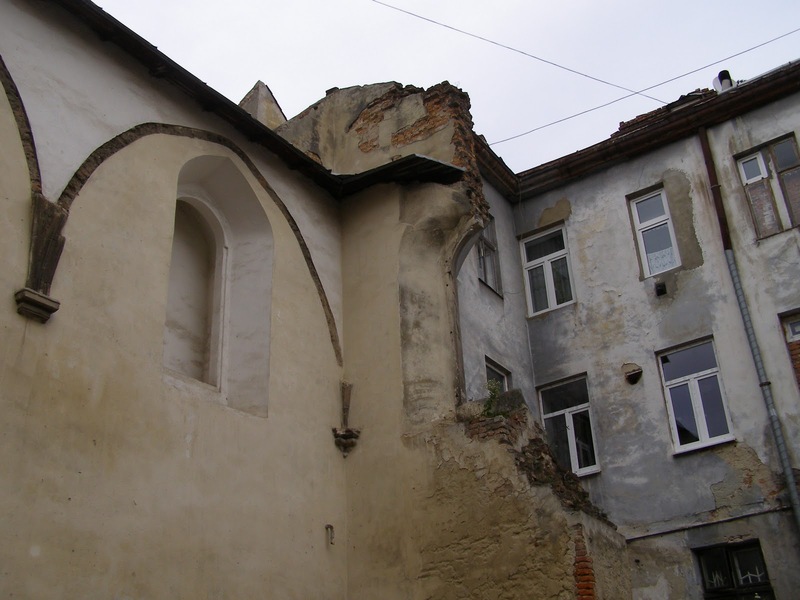 The future treatment of the ruins of the Turei Zahav Synagogue in L'viv, Ukraine (Lemberg, Lvov) is still being debated. 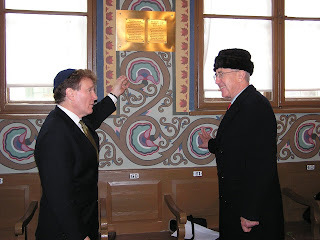 For the last three years at least the historic synagogue has been a focal point for all discussions of commemoration, preservation, and development in the Old Jewish Quarter of the historic, once multi-ethnic, Renaissance planned city. The discussion is an important one for the future of the building, for the memory of a lost population and for the direction this beautiful city will take in coming years. Will it be a welcoming city of art and culture on the border between east and west? Or, will it be an insular, xenophobic, and nationalist center. In truth, the future L'viv will probably be a combination of both, and much will depend on broad political and economic trends in Ukraine and Europe as on rational or emotional appeals. But the ground work has been laid since 2008 for a progressive and inclusive recognition of the city's diverse and complex past, and how this past can serve present and future needs. L'viv, Ukraine. 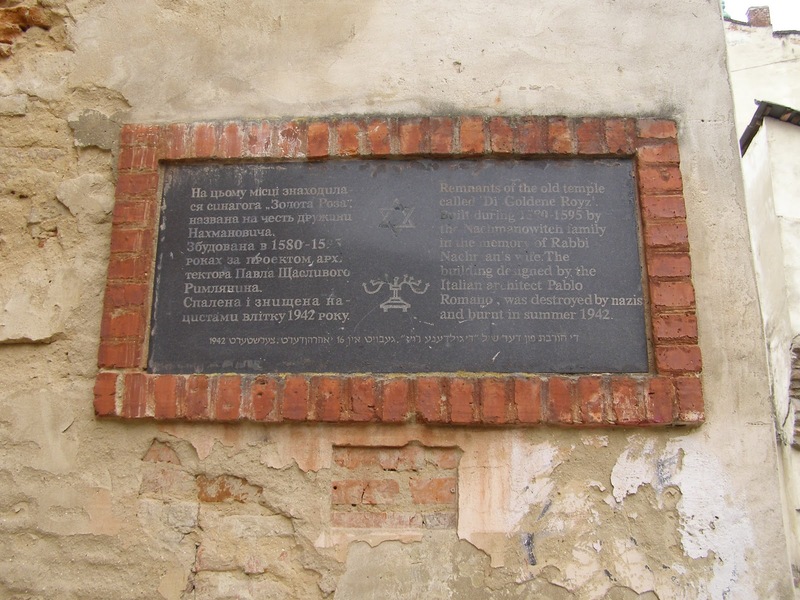 Golden Rose Commemorative plaque at synagogue ruin. Photo: Samuel D. Gruber (2008). 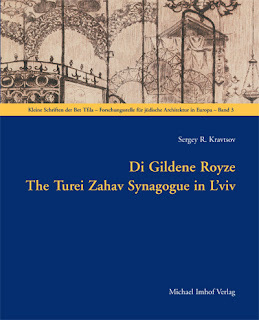 Kravtsov's well-illustrated account shows the synagogue in the city maps, architectural drawings, photographs, and numerous works of art depicting the structure during particular stages of its history. As much as possible, computer-aided reconstructions recreate the synagogue in its original state. Kosovo: Can New Treaty Stop Continued Deterioration of "New" Jewish Cemetery of Pristina? (ISJM) The fate of long-neglected Jewish sites in the newly independent small and poor country of Kosovo has recently received some attention. On December 14, 2011, U.S. Secretary of State Hilary Rodham Clinton and Kosovo’s President Atifete Jahjaga signed the Agreement on the Protection and Preservation of Certain Cultural Properties between the U.S. and Kosovo in Washington, D.C. The agreement, one of many originated over the past two decades by the U.S. Commission for the Preservation of America's Heritage Abroad, sets commitments and procedures for each side to protect cultural heritage sites, especially of religious and ethnic minorities. In the past two decades the Commission has given special attention to the documentation and protection of Jewish and Holocaust-related sites mostly through sponsoring site surveys and encouraging U.S. donors to support conservation, restoration and commemoration projects. According to Secretary Clinton "this is a really important agreement that we are signing today, because the United States has a special interest in helping to preserve cultural heritage sites in countries around the world, because the vast majority of Americans are immigrants and descendents of immigrants. So the work of this commission is of great importance to us." You can read all of Secretary Clinton's remarks here. Pristina, Kosovo. "New" Jewish Cemetery. Examples of deteriorated gravestones. Photos: Ivan Ceresnjes, (2012). 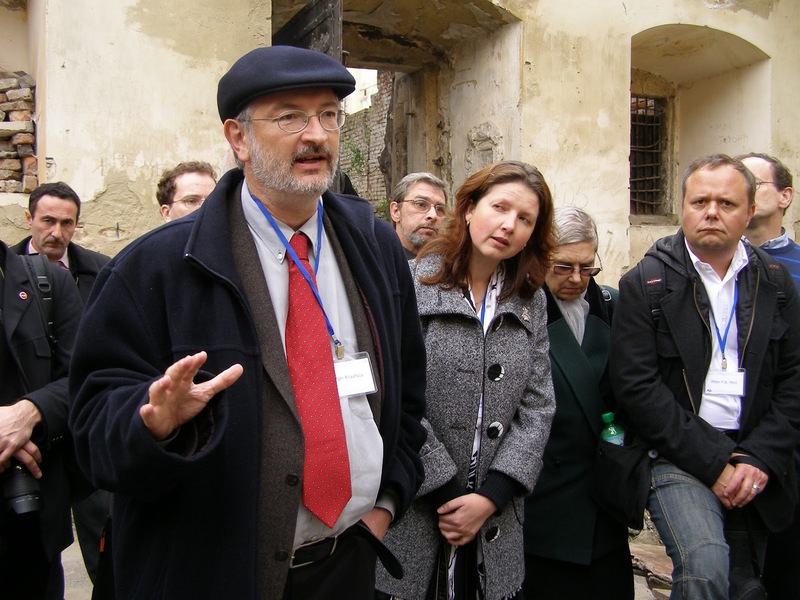 Ivan Ceresnjes, former head of the Bosnia Jewish Community and now a researcher at the Hebrew University of Jerusalem, has been visiting Kosovo regularly for the past decade and reporting on the continued deterioration of the Jewish sites. Ceresnjes, who has organized surveys of Jewish sites of Bosnia and Serbia for the U.S. Commission is particularly concerned about the fate of the "New" Jewish cemetery in the capital city Pristina. He feels this would an ideal project for international protection and conservation in the wake of the new treaty. He wrote: "Last time, a year ago ... I tried to see what is going on with the New Cemetery since I have seen from afar the huge infrastructural works being held around it but it was impossible to approach due to flooding of the area of both cemeteries (Jewish and Serbian) with sewage. [Now] in light of recent signing of the agreement between government of USA and present government of Kosovo I am just informing all of you about the sad reality on the ground - the quick and merciless destruction and disappearance of the heritage of one of the smallest and maybe the most endangered minority in Kosovo - the Jewish one." In addition to the continuing process of destruction by neglect at the "New cemetery and other sites, their was been vandalism against Jewish sites, too. Just last month, in December, 2011shortly before the cultural heritage treaty was signed in Washington, the Old Jewish Cemetery in Pristina, which had been cleaned last June by a group of students from Dartmouth College in New Hampshire and their peers from the American University in Kosovo was vandalized and swastikas and anti-Semitic slogans were spray painted on old gravestones. In 2008, Ceresnjes wrote at length about the difficulty of protecting Jewish hertiage sites - and memory of Jewish history - in the former Yugoslavia. (The Destruction of the Memory of Jewish Presence in Eastern Europe: A Case Study: Former Yugoslavia, 2008): Of Kosovo he wrote: "there were about 500 Jews before the Second World War, of whom 250 were handed over to the Germans by Kosovar Albanians. There were also a few examples where Kosovars killed Jews, and there was also a Kosovar SS unit. About twenty righteous gentiles helped the other 250 Jews escape to Albania where the Jews were protected. After the war, in Kosovo's capital, Pristina, a huge memorial was erected for all victims of Nazism including the partisans and the Jews. When the Serbian-Albanian fighting broke out in Kosovo in 1999, almost all names were removed, also including most of the Albanians who were considered communists. Kosovo is such a tightly knit society that everyone knows who was or wasn't a communist." The special issue focuses on the Eruv, with multiple articles addressing the history, forms and contemporary expression of the eruv and related issues of defining Jewish, and especially Orthodox, urban space. The Arts of Intimacy: Christians, Jews and Muslims in the Making of Castile. The Jack, Joseph, and Morton Mandel Wing for Jewish Art and Life, The Israel Museum, Jerusalem. Yigal Zalmona, 100 Years of Israeli Art. Jerusalem: The Israel Museum, 2010 [Hebrew]. A Land and Its Dolls: Israeli Souvenirs and National Identity, Eretz Israel Museum, Tel Aviv, 2011. Catalog edited by Shelly Shenhav-Keller and Haim. Crossroads: Jewish Artists during the Holocaust, National Museum of Art of Romania. The Promise. The Land. Jewish-Israeli Artists in Relation to Politics and Society. O.K. Center for Contemporary Art Upper Austria, Linz, 2003. Catalog edited by Thomas Edlinger. History of a Symbol), ed. A. Shapira, tr. and eds. G. Hazan-Rokem [Hebrew]. Rose-Carol Washton Long, Matthew Baigell, and Milly Heyd, ed., Jewish Dimensions in Modern Visual Culture. Melissa Muller and Monika Tatzkow, Lost Lives, Lost Art: Jewish Collectors, Nazi Art Theft, and the Quest for Justice; Peter C. Sutton, Reclaimed: Paintings from the Collection of Jacques Goudstikker. Vincent Brook, Driven to Darkness: Jewish Directors and the Rise of Film Noir. Cynthia Young, ed. The Mexican Suitcase; Richard Whelan, This is War! Robert Capa at Work; Richard Whelan, Robert Capa: The Definitive Collection. Jewish-Heritage-Europe.eu, an ambitious website intended to collate new and information about Jewish historic, religious and cultural sites in Europe funded by the Rothschild Foundation and active especially in 2006-2007, has been entirely redesigned and updated. The version of the site which is much more user friendly and contains more up-to-date information and news was given a "soft-launch" in Prague in December. The new site will include most of the old site detailed information on Jewish sites in European countries, but will update and expand this information, include many more photos, and link this material to news items, new publications and broader topics ad issues relevant to the study, preservation, protection and presentation of Jewish sites. "Jewish Heritage Europe is a comprehensive web site aimed at facilitating communication and information exchange regarding projects, initiatives and other developments concerning Jewish heritage and Jewish heritage sites: restoration, funding, ongoing projects, best-practices, advisory services and more. We hope to foster contacts among Jewish communities, private individuals or bodies, foundations, state and civic organizations, monuments protection authorities and other stakeholders and interested parties. As a project of the Rothschild Foundation (Hanadiv) Europe, our goal is for JHE to be a clearing house for a variety of such information and a go-to online resource for people involved or interested in Jewish heritage to find addresses, contacts and news. You can also find us on Facebook and follow our Twitter feed." To contribute information to Jewish-Heritage-Europe.eu write here. Two weeks ago I gave a lecture about New York synagogues, with special attention given to the large numbers of historic structures that have been named local protected sites and/or added to the National Register of Historic Places. 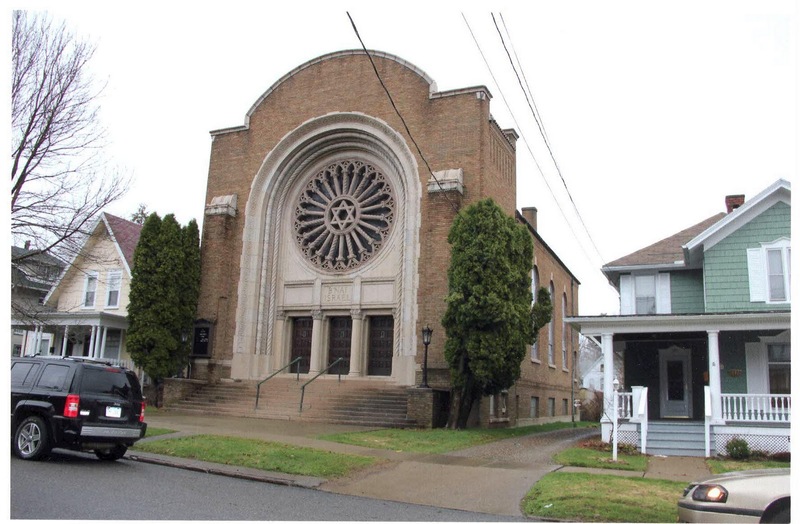 At the time I didn't know of the latest synagogue addition to the National Register; the 1929 Temple B'nai Israel at 127 South Barry Street in Olean, a small city in the southwestern part of the state. The National Register nomination was prepared by Katie Eggers Comeau of Bero Architecture PLLC in Rochester. 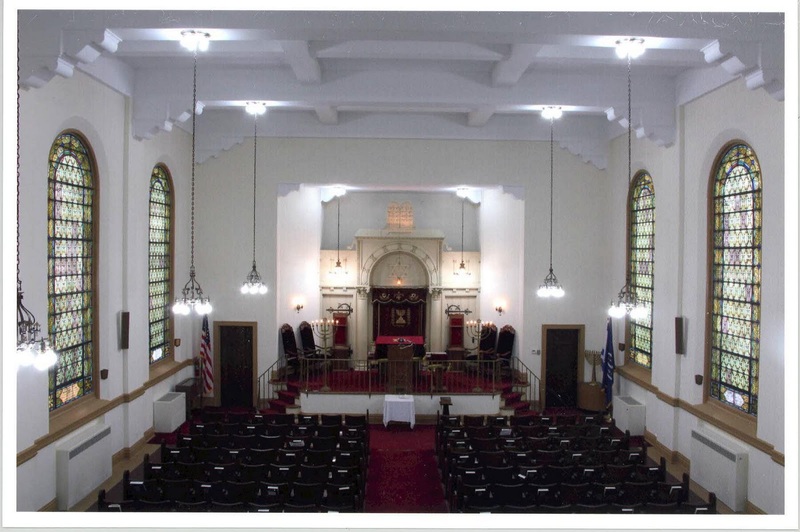 In the past twenty years the number of landmarked synagogues in New York State has grown into the hundreds. Originally, many structures were designated because they stood within the borders of historic districts - of which there are so many in New York City. 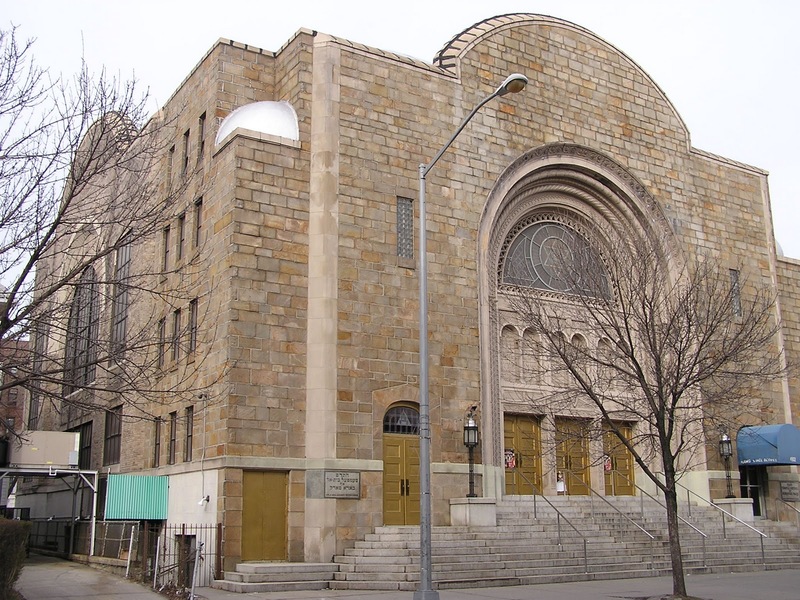 Over the years, however, as interest in historic religious structures has grown, more and more synagogues have been listed individually. In some instances this work has been spurred by organized regional surveys (as in Sullivan County). 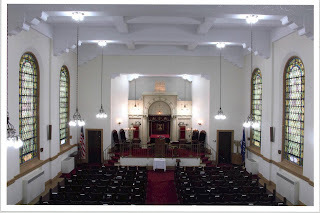 Outside of New York City many congregations, such a my own Temple Concord in Syracuse, have taken the lead in recognizing the history of their congregations and buildings and have prepared or sponsored the preparation of National Register nominations. There is also the recognition that NR designation can help in fund-raising for the ongoing maintenance and repair of historic structures through the Sacred Sites Program of the New York Landmarks Conservancy and other agencies. 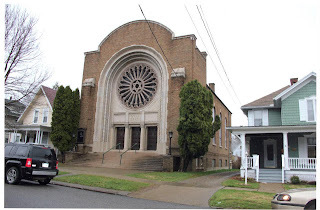 Temple B’Nai Israel, designed for the Olean Hebrew Congregation by local architect J. Milton Hurd (1895-1982) was dedicated on September 29, 1929, shortly before the much larger by stylistically related Temple Emanuel in Manhattan. Plans for the synagogue had been discussed for more than a decade, and Hurd was hired in 1927. Hurd was a graduate of Cornell in 1916, and seems to have worked exclusively in the region of Olean. Biographical information is provided in the NR nomination, but little is know of his other work. 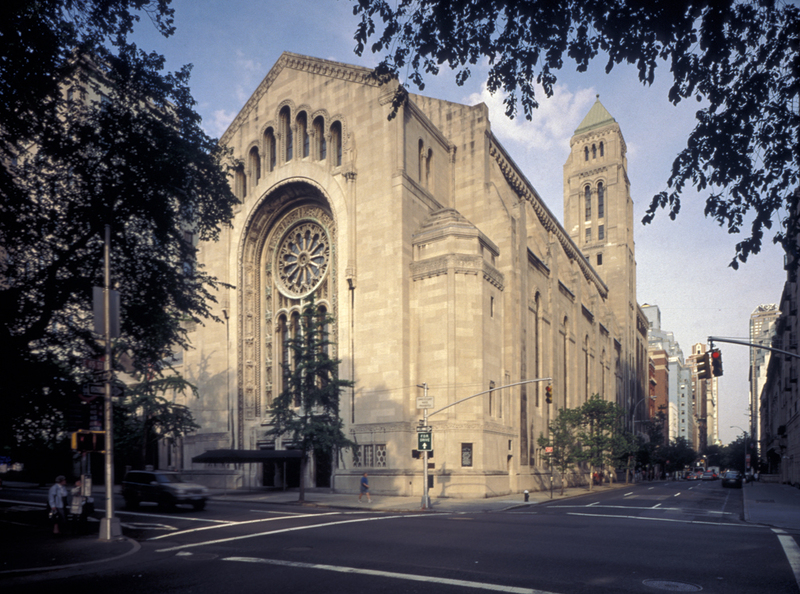 For the synagogue design he was certainly indebted to recent synagogues erected in New York City, many of which had been published in architecture magazines. 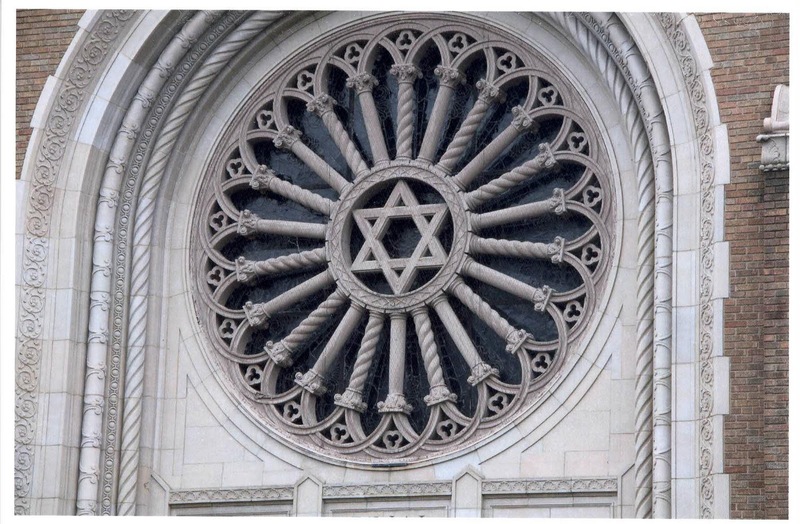 Olean's B'nai Israel's facade is dominated by a massive arch with common version of a Jewish 'rose' window. 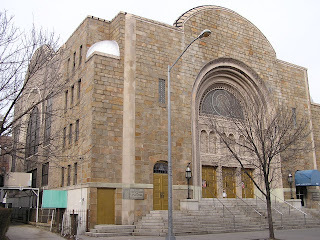 The NR nomination rightly compares it to New York City's B’Nai Jeshurun in Manhattan (Henry Herts & Walter Schneider, 1917-18) and Temple Beth-El in Brooklyn (Shampan & Shampan, 1920), to which we can add the demolished Mount Nebo Synagogue (formerly on 79th Street in Manhattan). Walter Schneider also designed Mount Nebo and thus probably deserves much of the credit for the popularity of this particular type of Byzantine-inspired synagogue facade type. The building also should be compared to the much larger complementary Temple Emanuel in Manhattan (Clarence Stein, Robert D. Kohn, and Charles Butler, archs., 1927-1930). Variations of the Byzantine style were favored for synagogue design throughout the United States in the period between word War I and the Great Depression. New York, NY. 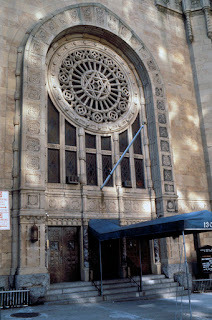 Temple Emanuel, dedicated January 1927-1930. Photo: Paul Rocheleau. Jews began to settle in Olean the 1880s when the city began to flourish as an early center of oil production (A history of the Jewish settlement, its most prominent members with sources is provided in the National Register nomination). Personal memories of growing up Jewish in Olean by Carol Levine can be read in Tablet Magazine. Jerry Klinger, who through through the not-for -profit Jewish American Society for Historic Preservation has organized the creation and installation of historical and commeorative markers at the many Jewish historic sites across the Unted States (and some abroad), and brought to my attention a section of the website of the (online) Museum of Family History, that documents monuments commemorating Holcocaust victims erected in Jewish cemeteries and New York and New Jersey. These monuments, often erected by landsmanshaftn (in the same spirit in which memorial books were compiled), are little known, and are increasingly forgotten. This on-line exhibit brings many of these monuments to public view, and offers and opportunity to remember and reconsider the fate of those who died. The web exhibit is well done, with good photos and complete transcrioptions of inscriptions and the names. There are believed to be thousands of physical memorials to the Holocaust in the United States, located mainly in synagogues and cemeteries, but also in schools, hospitals and increasignly in the past two decades in public venues. These memorials include small plaques and inscriptions; memorial plantings in gardens; larger statues and monuments; and permanent educational exhibitions and museums. There have been some (faield) efforts to document all these memorials, but to date there is no central inventopry or registry. At best, local historical societies and other groups keep records of lcoal examples. The webpage of New York and New Jersey cemetery monuments is a good example. "There is not one typical memorial, though most are made of stone or granite. Some are large and detailed, others are small and simple. Some list the names of individuals and entire families that perished. Some have a large amount written in Hebrew, in Yiddish or in English; others are written in all three languages. Some memorials even contain tangible remnants of those horrible times--ashes from Auschwitz or a bar of soap that was made by the Nazis from the bodies of their Jewish victims. It was the job of the landsmanshaftn, those social organizations that had originated in and represented their hometowns back in Europe, to care for their own. One of their many functions was to provide a burial place for their members. For these landsleit there were perhaps expectations that when they emigrated, other members of their family would eventually join them, spend the rest of their lives in a land that would truly welcome them, and perhaps at the end of their life, be buried alongside each other. For those that couldn't or chose not to emigrate, and for those would reluctantly left their families behind and be permanently separated from them, these memorials serve as a lasting tribute, a permanent link that connects them in both life and death. The Museum of Family History, created by Steven Lasky, is a virtual (Internet-only), multimedia, and interactive creation designed for those "interested in learning more about modern Jewish history, as well as those who were a part of this history, who now grace the many branches of our family tree. The Museum humbly attempts to honor the Jewish people and the Jewish family unit in particular." Vandals have damaged or toppled about 10 gravestones in the centuries-old Jewish cemetery in Puklice, near Jihlava. The cemetery is listed as a national cultural monument and had recently undergone restoration. Police are investigating the vandalism, which was discovered in the first week of January. The Puklice cemetery, which includes about 100 gravestones, is one of the oldest in the Czech Republic, probably founded in the 15th century. The oldest legible gravestone dates from 1699. The small Jewish quarter in the village itself is largely intact, with the remains of a mikvah and a former synagogue/school (now a residence). Jaroslav Klenovsky, who oversees Jewish heritage in Moravia for the Federation of Jewish communities, told Czech media that the vandalism was likely not a specifically anti-semitic attack, but the work of "young offenders." You can see a video of the damage HERE. 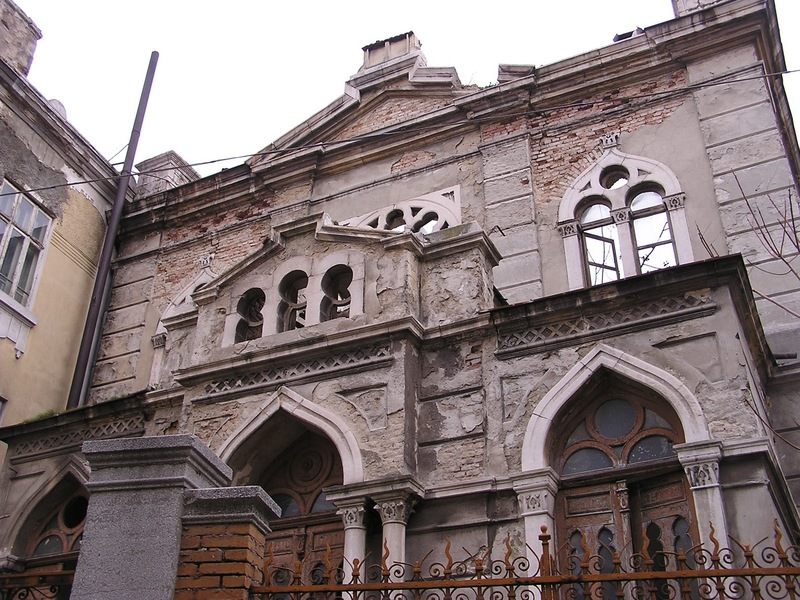 The United States Commission for the Preservation of America's Heritage Abroad has published a survey of Jewish Historic Monuments and Sites in Bulgaria, including information on the location, history and condition of synagogues and cemeteries. Some of this material has been posted on the website Jewish Heritage Europe and has circulated in other formats, but its has never been assembled in easy access and illustrated report form. The Commission report is posted in two parts. The survey includes information from several sources, including my own visits, to synagogues and former synagogues in Burgas (Bourgas), Dupnitsa (Dupnica), Gotze Delchev (formerly Nevrokop), Haskovo, Pazardjik, Plovdiv, Ruse (Ruosse), Samokov, Sofia, Varna, Vidin, Yambol (Iambol). The synagogues of Sofia and Plovdiv have been restored in recent years and continue as religious and cultural centers. 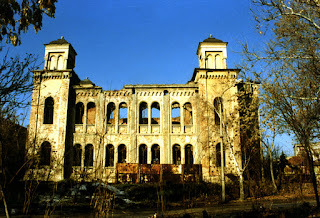 Many former synagogue,s however, such as those in Vidin, Varna and Samakov survive as only as ruins. Varna, Bulgaria. Sephardi Synagogue in ruins. Photo: Samuel D. Gruber (2004). Vidin, Bulgaria. 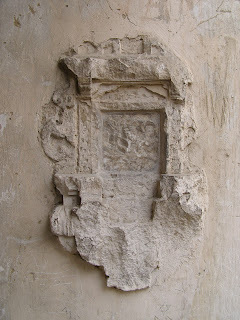 Sephardi Synagogue in ruins. Photo: Samuel D. Gruber (2002). 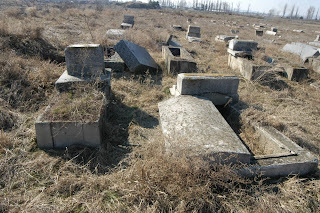 The most substantial part of the report includes mostly unknown and unpublished results and photographs from site visits by teams organized by the Jewish Community of Bulgaria to cemeteries in Burgas (Bourgas), Chirpan (Shirpan), Dupnitsa (Dupnica), Gotze Delchev (formerly Nevrokop) , Haskovo, Karnobat, Kazanlak, Kyustendil, Lom, Pazardjik, Pleven, Plovdiv, Ruse (Rousse), Samokov, Shumen (Kolarovgrad, 1950 – 1966), Silistra, Sliven, Sofia, Varna, Vidin, and Yambol (Iambol). While some of these cemeteries are well maintained, most have suffered significant damage from vandalism and neglect. For further information about any of these sites researchers should contact the Organization of Jews in Bulgaria - Shalom (info@shalom.bg). Despite the relatively small size of the survey and the report, it was a long time in the making. It began in 2002 when the Commission signed a cultural heritage agreement with the government of Bulgaria. I was then Research Director of the Commission and we began to organize a series of countrywide surveys to identify cultural and historic sites of religious and ethnic minorities whose heritage insufficiently recognized by culture authorities, or entirely ignored. Over several years teams identified and visited Muslim, Christian, Roma and Jewish sites throughout Bulgaria. In 2010 the Commission released a report on Muslim Sites, based on the extensive research of Stephen Lewis. A report on Protestant Christian sites in Bulgaria is forthcoming. by Professors Mark Stefanovich and Evelina Kelbetcheva of the American University in Bulgaria. A second part of the survey took place in 2005 and 2006 and included site visits, descriptions, and extensive photography of Jewish cemeteries. The Organization of the Jews in Bulgaria, “Shalom,” carried out this stage of the work. 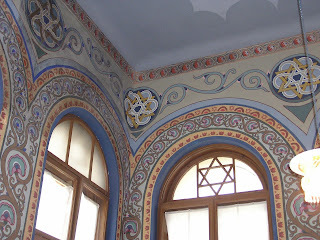 Becca Lazarova arranged for the survey on behalf of “Shalom.” On several visits to Bulgaria in 2003 and 2004 I made site visits to the synagogues and Jewish cemeteries in Sofia, Plovdiv, Varna, and Vidin. Becca Lazarova in Sofia and Boris Yakov in Varna were gracious hosts. While some time has passed since the initial draft of this report and its first circulation in 2007, the situation reported has not, to my knowledge, changed in any significant way. Several important former synagogue remains ruined and without purpose, and cemeteries throughout the country are ruined intentionally by treasure hunters, and naturally by neglect. Despite their best intentions, the small Jewish community in Bulgaria has limited people and money to address these problems.